The Torah puts great stress on character development — on becoming better people. This is called Tikkun [correcting] Middot [our character]. We must always strive to correct our faults and improve our character. The Torah also lays down a number of moral laws. The following is a shortlist of ways to better ourselves and a number of moral laws. Inside us we all have a Yetzer Tov — a good inclination [voice] and a Yetzer Hora — a bad/evil inclination. The Yetzer Tov constantly advises us to do good and act in a proper manner. The Yetzer Hora constantly challenges the Yetzer Tov and tries to advise the person to sin. There is a constant battle between the two, but with G‑d’s help and our own will power, the Yetzer Tov can win. We must conduct ourselves in a way that does not offend those around us. Judaism requires each of us to behave in a respectable fashion. This is called Derech Eretz. Included in Derech Eretz is respect for elders and teachers and respect for the laws of the land in which we live. Kiddush Hashem — The sanctification of G‑d’s Name. Chillul Hashem — The desecration of G‑d’s Name. Since the Jews were chosen by G‑d to receive the Torah — G‑d’s teaching to mankind, the Jews must behave positively, in an upright manner, and set an example to all mankind. Non-Jews will judge us by our actions, [“see how beautifully those whom G‑d has chosen behave.”] When a Jew behaves correctly, he makes a Kiddush Hashem — a sanctification of G‑d’s name. The opposite is Chillul Hashem. When a Jew misbehaves, commits a crime, or offends against the laws of the land, not only does he disgrace himself, but also the entire Jewish people and the name of G‑d Himself. There is no greater sin than Chillul Hashem. In short, if we expect mercy, we must show mercy. The Hebrew word Chessed חסד means kindness. Gemilut Chassadim are acts of kindness. 1) Rachamanim [as explained above]. 2) Byeshanim — being ashamed of their wrong deeds. 3) Gomlei Chassadim — being constantly engaged in doing acts of kindness. The word Tzedakah comes from the word Tzedek which means righteousness, or the right thing to do. Giving charity from our own money is the right thing to do. Consider it as if G‑d has given you money to give to the poor. The money does not really belong to you and you are obliged to give it away. A person must give charity according to his means. In general, one should always give away 10% of one’s income. Even a poor person must give charity. It is customary to have a Tzedakah box [Pushka] in every Jewish home, and the family is encouraged to give Tzedakah daily, especially before praying. One should never refuse a request for Tzedakah. The Tzedakah should be given with a happy heart, a smiling face and an open hand. G‑d repays a person for every bit of Tzedakah he gives. The rabbis tell us that if you want to become rich, you should give a lot of Tzedakah. Tzedakah should preferably be given anonymously, i.e. without anybody knowing [unless you want to show an example to others]. Tzedakah brings the coming of Moshiach closer. The Jewish home must always be hospitable. Guests must always be welcome at our table, particularly on Shabbat and festivals. The mitzvah of Hachnasat Orchim is so great that even when Abraham was being visited by G‑d, he ran out to meet his guests and invite them in for a meal. From this we learn that welcoming guests is greater than greeting the Divine Presence. We must visit friends who are sick, provide for them, cheer them up and pray for them. One must visit whether the person is rich, poor, young or old. G‑d visited Abraham after his circumcision. A special prayer may be said by the reading of the Torah for a sick person. This prayer is called Me Shebayrach. It is customary to give Tzedakah in merit of the sick and wish them a Refuah Sheleimah — a complete recovery. The first meal eaten by a mourner after the Levaya is a boiled egg and bread prepared by a friend or a neighbor. The mourners sit on a low stool. It is customary that a memorial candle is lit in the house of mourning. It is the duty of every Jew to give money and moral support to help a young couple set up a Jewish home. It is a great mitzvah to help pay for the wedding. This is called Hachnassat Kallah. A poor bride must not be disgraced through lack of dowry. From all the above, it is clear that we must follow G‑d’s example. Just as G‑d is merciful, so must we be merciful. Just as G‑d is generous, so must we be generous. Just as G‑d visits the sick, so must we visit the sick. Just as G‑d comforts the mourner, so must we comfort the mourner. Just as G‑d is kind, so must we be kind. G‑d gave some men and women extraordinary powers. These righteous people are called Tzaddikim. It is a great mitzvah to attach oneself to a Tzaddik and learn from his/her ways. One should always have faith in the words of a Tzaddik. G‑d commands us in the Torah “to cleave to Him”. 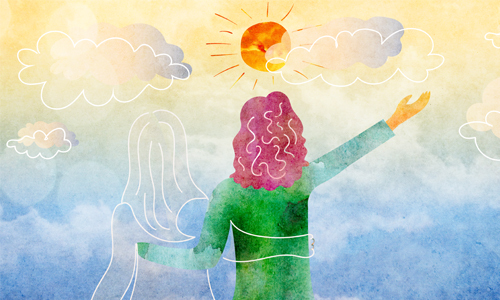 The Rabbis ask: How is it possible to cleave to G‑d? They answer: One who attaches himself to a Talmid Chacham [a Torah scholar] is considered as if attached to G‑d. It is a great mitzvah to support scholars and provide for their needs. If possible one should marry the daughter of a scholar and marry off one’s daughter to a scholar. Rabbi Akiva said: “Love your fellow Jew as yourself.” This is the general principle of the Torah. We must always have a feeling of love and respect for our fellow Jew, for really we are brothers in the same family. This is a golden rule never to be forgotten, and, as Rabbi Akiva said, a great principle of the Torah. One should never hate another person. If a person embarrasses another in public, the latter’s face turns pale with shame. The rabbis regarded this as a terrible act to commit. The rabbis advise: “Better fall into a fiery furnace than embarrass someone in public.” One who shames another in public, loses his share in the World to Come. Even if someone has wronged you, you should try to forgive them and certainly not take revenge. The Torah forbids not only revenge, but also bearing a grudge. Next day, B says to A: “Lend me your pencil.” A replies: “No, because you didn’t lend me yours.” That is Nekamah. If A replies: “OK, I will lend you my pencil, I am not as mean as you are,” that is Netirah, bearing a grudge. A should lend the pencil to B, forgive and forget. We must not sell anything for more than its value or give a false description of an article. We must not steal the knowledge or belief of another or take advantage of another’s ignorance. Another type of “stealing” is being noisy and disturbing a person’s sleep. This is called Gezzel Sheena. The Torah warns us, “Do not place a stumbling block before the blind.” This verse is interpreted both in its literal meaning and also in a general meaning, i.e. one should not mislead the innocent by deliberately giving bad advice. It should be obvious that we must refrain from any action that involves us taking anything that is not ours — either stealthily or deceitfully as a thief [ganav] or openly and brutally as a robber [gazlan]. We must be careful not to use anything without the knowledge and permission of the owner. Respect for other people’s property is a basic law of Judaism. If a person finds any property whose owner could possibly be traced, he must not keep it. Otherwise he is guilty of theft. Great effort must be made to find the owner, such as placing as advert in a paper or reporting lost property at a police station. We must not willfully destroy anything just for the pleasure of destruction. Everything is put into this world for a special purpose. Everything has its use. We must not waste what can be put to good use. This does not mean, of course, that we accumulate everything and never throw anything away. It simply means that we must make full use of what we own. For example, one should not throw away good food or good clothes. One should also recycle goods. We are forbidden to inflict needless pain on any creatures. We should even feed our animals before we ourselves sit down to eat. In which ways should children honor their parents? Not sitting in their place. Bringing and fetching what their parents need. Where applicable, feeding and clothing them. Not waking them up when they are sleeping. The Torah promises that one who honors his/her parents will merit long life. This is a special mitzvah and mark of respect which the young perform for the old. When an older person enters the room, the young must stand. Due honor must be given to rabbis and teachers. Children should stand when they enter the room and always show Derech Eretz [see above]. Emet means truth. One must always tell the truth. Emet is made from three Hebrew letters א, מ and ת, the first, middle and last letters of the alphabet, to teach us that truth is from the beginning to the end, the whole truth. It is forbidden to lie [except when telling “white lies” to preserve the peace]. One must always search for a peaceful solution to any difficult matter. The Torah ascribes the greatness of Aharon [Moses’ brother] to the fact that he always made peace between his fellow men. Never be haughty — always be humble. Know your advantages and your disadvantages. Always try to look at other people’s good points. Never be arrogant. “Serve G‑d with joy.” Imagine if a great king asked you to do him a small favor. Wouldn’t you run with joy to do it? So too, G‑d has asked us to keep mitzvot and we should be full of joy and happiness when keeping them. Joy is called Simchah. 1) Regret — to regret the misdeed. 2) Vidui — verbal expression ... to say out loud [to yourself, not in front of others] what you have done wrong. 3) Resolve never to do it again. One should do Teshuvah a whole year for one’s misdeeds, but particularly one should do Teshuvah on Yom Kippur. A person should always be modest both in dress and in character, whether in public or in private. The Torah has a dress code for men and women. Parts of the body which are usually covered must be covered at all times. Men should cover their heads with a kipah, or Yarmulka [this is an Aramaic word meaning Yarei = fear, Malka = King. A Yarmulka reminds you that you stand before the King of Kings at all times]. Married women should cover their hair with a scarf, hat or wig (shaitel). A woman’s skirt should cover her knees and shirt sleeves should cover the elbow. A man may not wear women’s clothing and vice versa. The Torah also teaches that boys and girls should not touch each other (shomer negia), nor act in an indecent manner. Don’t they have the right to know?